We’ve made it to the middle of the week and it feels good. 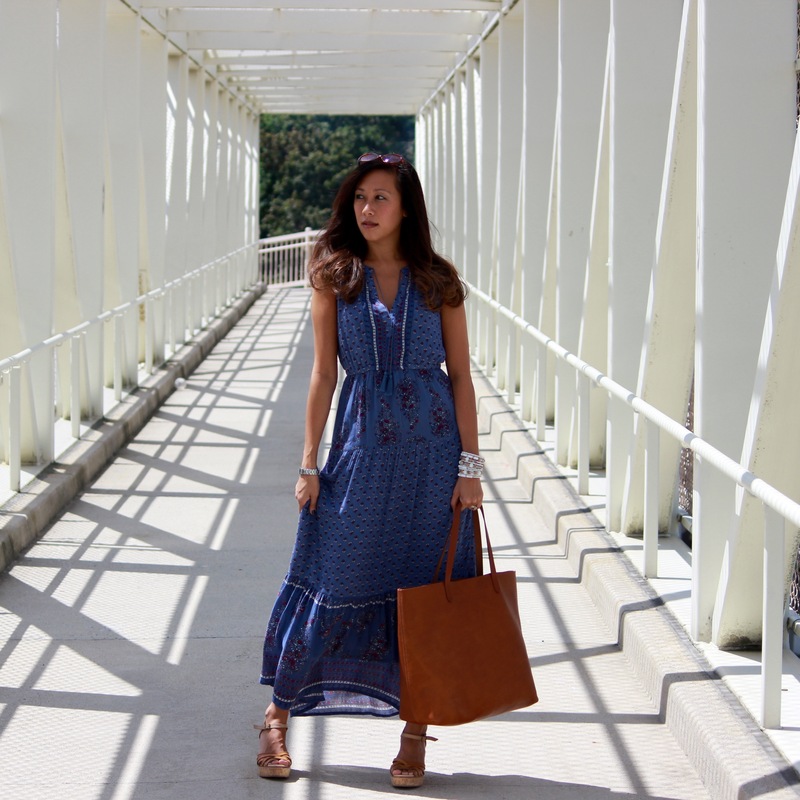 While the days are starting to be a little cooler, and a new season will soon be upon us, summer is not summer without a maxi dress. 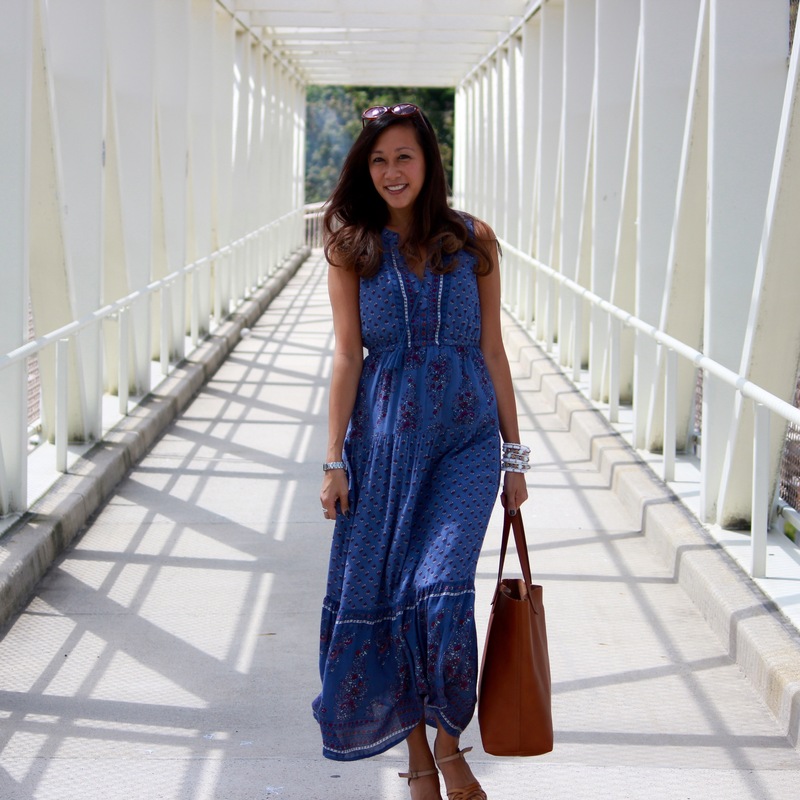 I love this tiered maxi that I got from Old Navy. It flows so nicely and the fabric isn’t heavy, even with the lining, which is great for warm days. Then as the cool nights start to roll in you could transition and totally pair it back to a denim jacket. You can even get a little more edgy with a leather jacket. I bought it in the blue print, but it also comes in a pink and a white print. Today they’re all on promotion for under $45. I’m definitely thinking of going back for the white one. It doesn’t drop to the floor like some other maxis, this one is meant to stop at your ankle. The dress has a split neckline with a nice tassel detail. I’m wearing cork wedges from Gap that are a few years old, but have been a great go-to for summer. I found similar pairs by Callisto (available at DSW) and Kate Spade (available at Lord and Taylor). My Madewell Transport Tote has been my everyday bag this summer. It’s great for carrying everything I need and dividing everything into smaller totes helps to keep me organized. Enjoy this sunny day today and remember… Only a few more days until the weekend!